Home / Portfolio / Generali in History. Tales from the Archive. Nineteenth Century. Generali in History. Tales from the Archive. Nineteenth Century. 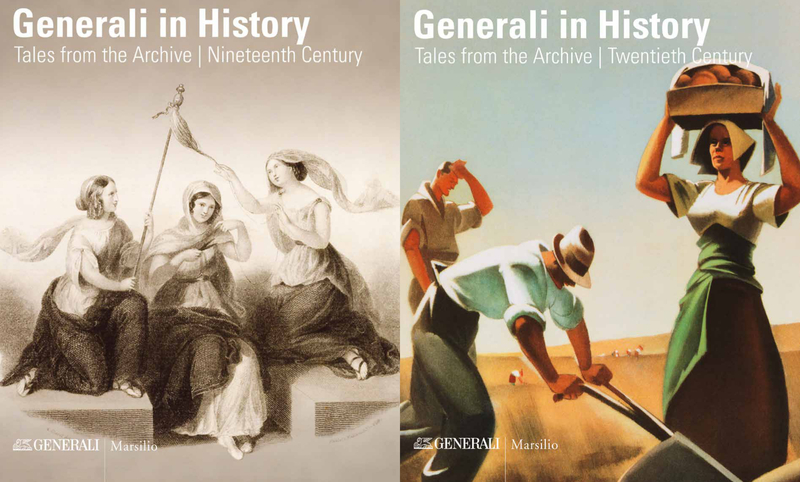 The Generali in History. Tales from the Archive box-set curated by Assicurazioni Generali, contains two volumes born out of the desire to promote the valuable archival heritage of the Generali Historical Archive: through this archive it is possible to reconstruct the development of a large international insurance institute from its origins and recount two centuries of history – both Italian and worldwide. Small and big stories such as the La Fenice theatre fire, an out-of-the-ordinary insurer named Kafka, Umberto Nobile’s expedition to the North Pole, the launch of a missile: these and many other subjects are covered, testifying to the original pioneering spirit and adaptation of Assicurazioni Generali to political and market contingencies. The books, available in both Italian and English, with one dedicated to the 19th and the other the 20th century, are based on closely related document and people close-ups, focusing in particular on Company events and characters, starting from the most significant documents held at the company Archives. General historical profiles and a review of brief news about different periods help to situate the files within the economic and political landscape of reference. The volumes are accompanied by a rich iconography and include specific essays, dedicated for example to evolution of the brand and advertising, as well as an overall index of all executive positions in the first hundred and fifty years of life, from 1831 to 1982. © 2016 by Assicurazioni Generali s.p.a.
Watch the trailer or browse the brochure.